Many Arabs living in Palestine and in Palestinian refugee camps are Christians. With centuries of history in the region and a peaceful relationship with the Muslim Palestinian community, these Christian make up a unique and vital part of the Christian Church as a whole. They have been active in the region since Biblical times and were victimized during the Crusades by both sides, but particularly the “Christian” side because of their Arab ethnic roots. There are an estimated 400,000 Palestinian Christians worldwide, and roughly 175,000 still living in the Holy Land. Approximately 50%-60% of Palestinian Christians have emigrated to countries outside of their homeland. During the 1948 Arab-Israeli War, 50-60,000 Palestinian refugees fled their homeland, and their descendants continue to live in refugee camps today in the West Bank, Gaza Strip, Lebanon, Jordan and Syria. Bethlehem, located in the West Bank, is mostly Palestinian, as are other Biblical cities, including Jericho. Palestinian Christians get along well with their Muslim neighbors for many reasons, including the fact that they typically live in very urban areas. Living so close together with other cultures, they have learned to emphasize cooperation and communal sharing. After many wars and the increased opportunities to learn and work abroad, emigration has plagued Palestinian Christian communities and caused a drastic decrease in population in and around the Holy Land. 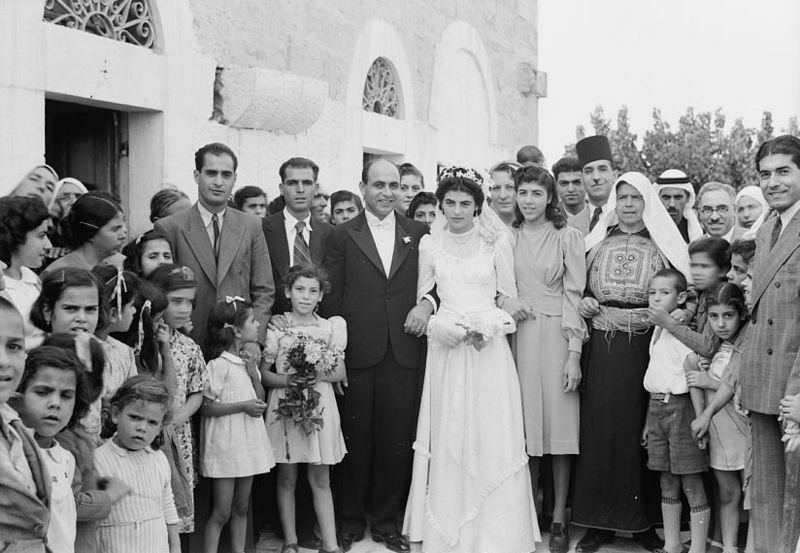 The majority of Palestinian Christians are Greek Orthodox and Roman Catholic, while some are Coptic, Armenian, Protestant, and other denominations. As Palestinian Christians are fully Arab, and fully Palestinian, they are subject to the same treatment as Muslim Palestinians, including limited ability to move freely through the country and rationed resources. For this and many other reasons, Palestinian Christians generally join other Palestinian peace efforts in supporting the establishment of a two-state system. Learn more from an article by Bernard Sabella, professor of sociology at Bethlehem University. For more history of Palestinian Christians during the era of the Crusades, see Amin Maalouf’s book The Crusades Through Arab Eyes. This is a fascinatig subject. You probably know this already but very few people know what the term Palestinian means. What criterion permit a person to be defined as Palestinian? Why do they war against the Israelies? Which people has a longer history in their land, Palestinian or those called Israelies? What does it mean to be Israeli and how did they come to occupy the land they live upon? How long have they lived there? Who has the most just claim to occupy that land and force others out? Why does it concern the US? Why do we underwrite Israel’s defense budget and provide billions in addition to military aid when we are essentially bankrupt? Why do US State Department Personnel say “our committment to Israel is non-negotiable?” What would make it so? Are Palestinians really defenselesss victims, in effect prisoners of war without international rights normally afforded people with that status, or is that all just hype. What evidence do we use to formulate our opinions? Could our opinions be wrong? Does it make any difference? Do you have any answers? Females virtually no louis vuitton wallet for a longer period invest in two and a half bags 12 months, talks about Ellen Goldstein, chair in the add-ons design and style department at Fresh York’s Vogue louis vuitton wallet Institution of Engineering. “Now they purchase from several in order to 15.